installaware's powerful msicode simplifies setup development by transparently managing all of your windows installer conditions, installation sequences and parameters using a concise and human-readable setup language. drop-in setup actions are configured using dialogs, without requiring programming skills. msicode builds a standard windows installer database package that fully supports advertising, install-on-demand, elevated privilege installation, and resiliency. 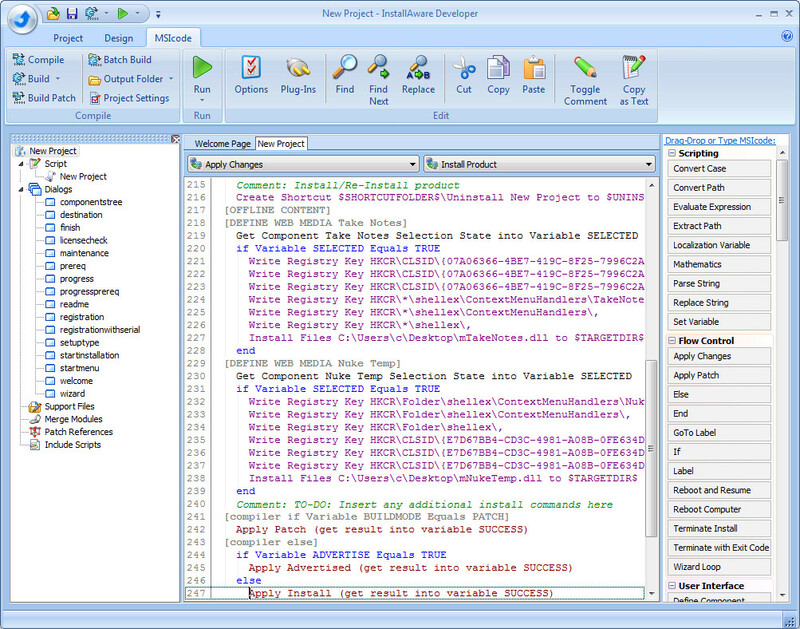 installaware's advanced development tools include wizards, templates, drag-and-drop editing, and refined task views-with the added benefit of immediate msicode generation. start a project in seconds in with visual tools, then switch to the code view to add branching logic, variables, and advanced configuration options. unlike installshield's isolated script and visual environments, when you modify settings in one view, the other view changes instantly. deploy technology modules and runtimes, such as microsoft sql express 2008 r2, from your setup in a single step. any related preinstalls are added to your project automatically. plus, the preinstall sequence branches by platform. installaware uses all available processor cores during the build process to reduce build times. you have the latest in hardware - why let your software hold you down? build twice as fast with a dual core processor, and four times as fast with a quad core processor. scale up to more cores effortlessly and automatically. reduce the size of your setups and download packages by up to 5x with the lzma compression algorithm and bcj2 compression pre-processors. only installaware provides advanced compression for windows installer setups. build windows installer msi setups with fully customized user interfaces. create windows installer msi setups with easy msicode scripting. msi installer for iis, sql, web updates, x64, vista, difx driver installs. import and customize msi windows installers, remotely build setup programs. free installer that creates setups inside visual studio. Deploy Applications without Installation using Application Virtualization.